Transformation is the process through which bacteria can pick up foreign DNA from the surrounding environment. The newly acquired genetic information is both stable and heritable. In the laboratory, we can transform bacteria with small, circular pieces of DNA called plasmids. These plasmids are engineered to contain genes from different sources. Once transformed into bacteria, the plasmids turn the bacteria into living factories to create medications, vitamins and other useful products. Transformation is the process through which bacteria can pick up foreign DNA from the surrounding environment. The newly acquired genetic information is both stable and heritable. In the laboratory, we can transform bacteria with small, circular pieces of DNA called plasmids. These plasmids are engineered to contain genes from different sources. Once transformed into bacteria, the plasmids turn the bacteria into living factories to create medications, vitamins and other useful products. For example, scientists use bacteria to make insulin, the medication used to treat diabetes. In the classroom, we can program E. coli with a jellyfish gene, making them glow bright green! Trust me, this experiment will amaze your students. Figure 1 highlights four of our transformation kits. 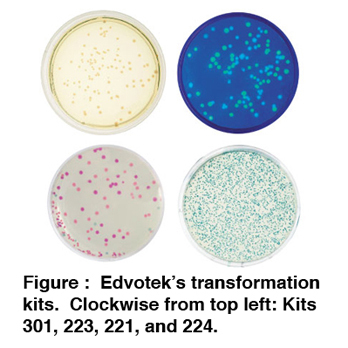 We’ve optimized these experiments to be robust and reproducible in your classroom laboratory. Here are five suggestions to ensure your students have experimental success. 1)	Preparation of the source plate: For best results, the source plate needs to be fresh! This makes sure the cells are healthy and ready for transformation. Be sure to streak out the BactoBeads™ on an agar plate 16-20 hours before the laboratory period. Do not store the plate in the refrigerator before use. 2)	Resuspension of the bacteria: After the bacterial cells are added to ice-cold calcium chloride, two things can go wrong. One problem is that the cells are not completely resuspended. This means the plasmid will not come into contact with most of the bacterial cells. The second problem is the cells get too warm during the resuspension. This affects the temperature differential essential for the heat shock (see #4). We recommend resuspending the cells by pipetting up and down until no clumps are visible. In addition, to avoid warming the cells with your hands, hold the top of the tube instead of the bottom where the cells are. 3)	Amount of plasmid DNA: Understandably, too little plasmid DNA will reduce the transformation efficiency, but did you know that adding too much plasmid could also affect your results? Although the plasmid concentration in our experiments has been optimized, pipetting error can affect your student’s results. Make sure your students know how to accurately pipet before the experiment by practicing with Kit S-44, Micropipetting Basics. 4)	Temperature: It is believed the combination of chemical ions and the rapid change in temperature (i.e. the “heat shock”) alters the permeability of the bacterial cell wall and membrane. This allows the DNA molecules to enter the cell. For best results, be sure to keep the cell suspension ice-cold before and after the heat shock. Additionally, before heat shocking, use a thermometer to confirm that the water bath reaches at 42°C. 5)	Recovery period: During this incubation, the bacteria repair their cell walls and express the antibiotic resistance gene. Be sure to allow the cells enough time to recover. If the cells are plated too soon, they may not be able to grow on the selective media. However, after 30 minutes of recovery, the bacteria will double, meaning that many of the "transformants" are produced by cell division and not by transformation. For more information about transformation, be sure to check out the rest of the information on our Resources Page.